There's nothing like the beauty of natural wood, and the Croydex Bloomfield Traditional Oak Soft Close Toilet Seat brings that naturalism into the bathroom in a design that is built with comfort, durability and hygiene in mind. 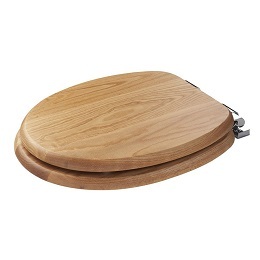 This high quality toilet seat is constructed out of MDF wood, which has been given a natural oak finish that shows off the intricate grain of the material. The light colour of the finish allows the toilet seat to brighten up the decor, and it coordinates with a wide variety of decorative palettes. The chrome-plated hinges add to the sleek appeal of the toilet seat. The Croydex Bloomfield Traditional Oak Soft Close Toilet Seat is designed to eliminate one of the most annoying problems that come with installing a custom toilet seat--poor fit. This toilet seat has a Sit Tight double fixed mounting which prevents the seat from rocking or wobbling when you're seated. The chrome-plated hinges adjust, so that they can suit fixing hole centre distances of 110 millimetres to 200 millimetres in size. Once installed, the toilet seat's soft close lid will shut quietly with every use, and the antibacterial coating on the wood will help to ensure that your bathroom remains sanitary.